An exterior view of the new Exxaro headquarters at Growthpoint’s prime Lakeside office site on West Street, Centurion. 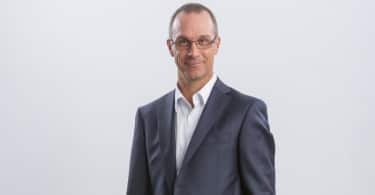 Growthpoint Properties has commenced its multi-million Rand development of a new head office for Exxaro, one of the largest and foremost empowered South African-based diversified resources companies. 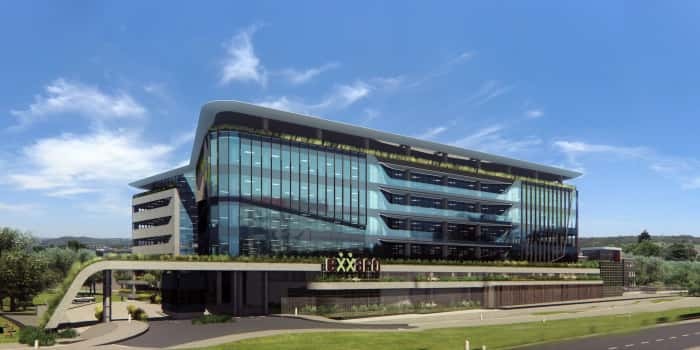 The development of the new Exxaro headquarters is the second phase of Growthpoint’s redevelopment of the prime Lakeside office site on West Street, Centurion, directly opposite the Centurion Gautrain Station. Exxaro’s new corporate headquarters will consolidate its current offices in Pretoria and Johannesburg into a single thriving workspace, located at a convenient midpoint in a decidedly accessible location for its staff and business partners. Exxaro has business interest locally as well as in Europe and United States of America. Growthpoint’s highly skilled development and workspace design team is delivering an innovative green building, integrating P-grade aesthetics and finishes and high-performance workspace. Exxaro will occupy all of the new building’s 18,500sqm of gross lettable area on a long lease. The development broke ground in February 2017 and construction will commence from September this year. It will be complete for occupation in early 2019 when it will be able to accommodate up to 1,400 Exxaro staff members. For its design, construction and operation, the new Exxaro head office is in tune with top commercial buildings in the world’s most prominent urban centres. Designed by award-winning AMA Architects, the signature office building flows with a series of layered fluid curvaceous forms, in flushed glaze detail. Its welcoming triple-volume entrance and reception open onto an airy atrium that soars upwards through at the core of five floors of efficient workspace. Custom designed to support Exxaro’s business goals, ethos, values and vision, the building’s five storeys of offices will sit atop four storeys of structured basement parking, creating a powerful scale for this new landmark. This will give it excellent visibility, not only for anyone stepping out of the Gautrain Station but also when viewed across Centurion Lake. Reflecting Exxaro’s environmental commitment, the building is designed for a 4 Star Green Star SA certification from the Green Building Council of South Africa (GBCSA), which is also in line with Growthpoint’s high environmental standards for its offices. Working with the development’s appointed green building professionals, Aurecon, the design team has incorporated several environmentally sustainable initiatives into the building. Green measures include zoned lighting, energy-efficient building services and systems, water-efficient fixtures, rainwater harvesting for use in toilets and landscape irrigation, water-wise landscaping, and low VOC interior finishes to ensure high level of indoor air quality, in addition to abundant fresh air. While its performance glazed façade will let in generous natural light, its clever design also shields actual sun penetration into the building, helping to keep its interior refreshingly cool while offering inspiring outdoor views. Also supporting the building’s lighter carbon footprint is its access to alternative modes of transport for commuting to work. It is on the doorstep of the Centurion Gautrain Station and at the heart of a public transport node. It is also close to many retail, banking, health and medical facilities. The property provides dedicated parking for more fuel-efficient vehicles, such as hybrids, electric cars and mopeds or scooters, as well as bicycle racks. Generous terraces skirt the building, creating outdoor park-like pause areas for staff that are designed to complement the building, which also connects to the outdoors with balconies and a roof terrace with 360-degree views. The building dedicates an entire vibrant level to meeting, interacting, engaging and collaborating. It features a restaurant and canteen with its own kitchen, a state-of-the-art auditorium, and a coffee shop. “Growthpoint’s new development for Exxaro also signifies the beginning of the urban transformation along the commercial edge of Centurion and approaching the Gautrain Station,” says Nico de Jager, Regional Asset Manager for the Office Sector of Growthpoint. “Working with the City of Tshwane, Growthpoint is upgrading the roads and traffic flows in the area, including adding a new right turn lane from Gerhard Street into West Avenue,” explains de Jager. Traffic signal settings on West Street, around the building, will be refined. Also, Growthpoint is working with the city to create a vibrant pedestrian walkway along the development’s street boundary. “We are invested in improving the areas surrounding the new Exxaro head office. 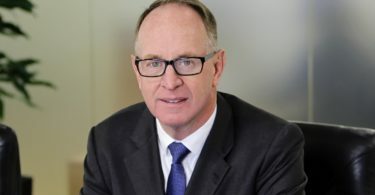 This responds to the growing popularity of the area, increasing development in the immediate vicinity and the higher number of people who access the area through West Street,” says de Jager.